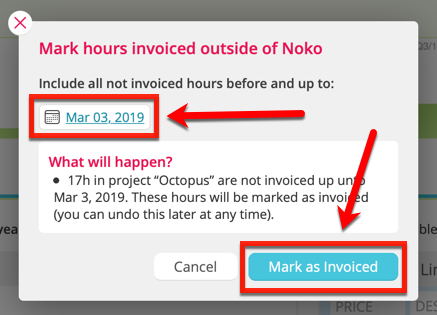 If you invoiced time outside of Noko, but want to switch to Noko's invoicing now you can conveniently mark hours as previously invoiced. The affect entries won't be considered for Noko's invoicing when you run reports or create new invoices from a project page. Go to the project you want to mark previously invoiced hours for. Click on Mark hours… in under Invoices. Set a cut-off date in the dialog that appears, and confirm by clicking Mark as Invoiced.